Wallpaper is something that catches my eye over and over again, and consequently gets featured on this blog quite out of proportion with other decorative flourishes. And here we go again! This time, it’s a lovely design called Topo Azul from Pattern Tales, designed by Barcelona based artist, Ana Montiel. 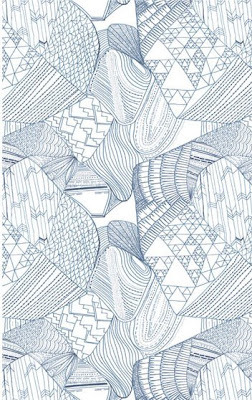 Close up, it looks to me like an intricate design of the type one might doodle with a blue ballpoint during a lecture. I don’t know how Ana went about designing this pattern, but I love the idea of an idle doodle like this covering an entire wall, don’t you? 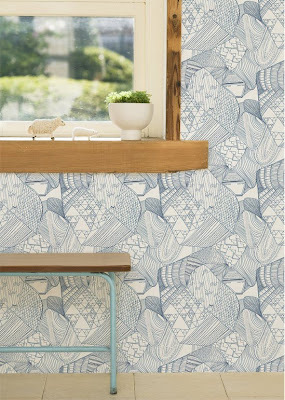 Visit the Pattern Tales website to see more lovely wallpapers and prints, all printed on premium non-woven Finnish paper.